Can Kevin Harvick keep the good times rolling? NASCAR heads to Kansas Speedway this weekend for the KC Masterpiece 400. Saturday night (May 11) marks the Monster Energy NASCAR Cup Series’ return to intermediate track racing following a four-race stretch of short tracks and superspeedways. FanDuel debuted its new daily fantasy NASCAR contest at Talladega two weeks ago and it will continue on throughout the 2018 season. This weekend, you can win a piece of Dalton Sargeant's truck from GMS Racing and the contest is ABSOLUTELY FREE! Why not sign up and check out what FanDuel is all about! 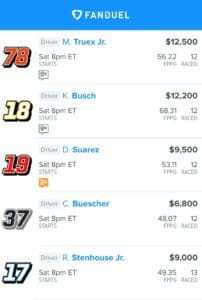 Check out fanduel.com/frontstretch for more information. FanDuel has put more of an emphasis on finishing position than other DFS sites. For this reason, FanDuel allows you to look at the entire field instead of just dominators and big movers. Also, with only 0.1 points awarded for each lap led by a driver, the need for a dominator is less important when building a winning lineup. This 267-lap race will only have a total of 26.7 points up for grabs in this category. Take note when building your roster and focus on mid-pack drivers who can climb up toward the front on race day. Here are a few drivers to keep an eye on for the KC Masterpiece 400, courtesy of Frontstretch.com's Corey Brewer. Harvick has an average finish of 3.5 in the past four Kansas races, including a win in the fall of 2016. He has led laps in the last three races and in eight of the last nine at the track. Harvick is the first driver to four victories in 2018 and is one shy of his career high for a single season. Two of his four wins have come at 1.5-mile tracks and he completely dominated the competition both times. The No. 4 Ford driver is the clear favorite here. Truex swept both Kansas races last season and led over 90 laps in both. That's par for the course as through the past two years, Truex and his Furniture Row Racing team have been the king of intermediate tracks. He was atop the MENCS in laps led in both 2016 and ‘17, and then was the winningest driver during his championship campaign a season ago. The majority of those stats were racked up at 1.5-mile ovals exactly like the one NASCAR is racing on this weekend. Right now, Truex sits ninth in points with one win. He has not been as dominant to this point in 2018, but there is a string of tracks coming up where this team could easily turn that around. Busch’s 10th-place finish in the fall Kansas race was also his worst in the past six races. In fact, it was the only time during that span where he finished outside the top five. His lone Kansas victory came in early 2016, part of a stunning turnaround at what was one of the driver's worst tracks. Busch has been phenomenal in 2018. He had three wins in a row a few weeks ago and also strung together a run of seven straight top-three finishes. Busch suffered his first DNF last week at Dover but still sports an average finishing position of 8.4 through 11 races. He's a strong pick here. Kansas is by far Blaney’s best track. In six starts, he has three top-five finishes. Blaney was 19 laps short of winning this race from the pole in 2017. He followed up a fourth-place finish with a third in the fall, also combining to lead 86 laps in those events. Blaney has shown the ability to take control of races since his switch to a full-time Penske driver this offseason. He has led over 100 laps in three separate races so far in 2018 and is part of a Team Penske Ford trio that's working well together. He is much cheaper than the top three options this week and packs heavy upside. Suarez tied a career high third-place finish at Dover last week and is sporting a recent hot streak. Over the past four races, Suarez has become a weekly top-10 competitor. Since injuring his hand in a second-lap wreck at Texas, the Joe Gibbs Racing driver has an average finishing position of 8.5. Sure, Suarez's FanDuel salary has jumped nearly $1,000 in the past week. But he is still considered a worthy mid-lineup option. Stenhouse finished 11th in this race last season. That matched his personal best finish at Kansas set during his debut back in 2013. The Roush Fenway Racing driver has been hit or miss this season. But when he is on his game, Stenhouse is a top-10 driver. With the recent changes at RFR, his No. 17 team is also more motivated than ever to make a run. This weekend should provide the opportunity, especially with the return of veteran Matt Kenseth to the fold. Dillon had a pair of top-six finishes at Kansas in 2016. While that might be a reach for how the team is running right now, a top 15 can still be achieved. The Daytona 500 winner finished 16th in this race last season and followed that up with a 14th-place finish in the fall. Dillon also boasts a low salary at Kansas. Add in those good runs and he makes for an intriguing option in the No. 3 Chevrolet. Buecher is a low-priced driver with a bit of success at Kansas. He has an average finish of 17.2 through four races, a total which ranks him 10th among active full-time MENCS drivers. He finished 18th and sixth in the two Kansas races last season and his worst career finish here is 24th. That's still respectable, especially when the level of equipment he has been driving comes into play. Buescher has finished 15th twice this season on intermediate tracks. If he can gather another top 15, that will be well worth the money spent to get him in a lineup.